The Consumer Complaints Council (CCC) of the Advertising Standards Council of India (ASCI) has banned as many as 114 advertisements out of 193 complaints it received across segments during August 2017. Out of 114 advertisements against which complaints were upheld, 51 belonged to the Healthcare category, 31 to the Education category, followed by 17 in the Food & Beverages category, five in the Personal Care category, and 10 advertisements from other categories, the self-regulatory industry body said in a statement. ASCI said it processed complaints against advertisements from general public, industry as well as from the Department of Consumer Affairs’ Grievances Against Misleading Advertisements (GAMA) Portal. Out of 93 advertisements, complaints against 52 advertisements were upheld. The self-regulatory industry body also picked up 100 advertisement through its suo moto surveillance of print and TV media via National Advertisement Monitoring Services (NAMS) project. Out of the 100 advertisements, total of 62 advertisements were considered to be misleading. Of these 32 advertisements were from Healthcare, 26 belonged to the Education category, two from Personal Care category and two from Food and Beverage category, ASCI said. The banned ads are from prominent companies like Bharti Airtel Ltd, Amazon.com Inc (Parachute Advanced Coconut Hair Oil, Dabur India Ltd (Dabur Odomos), Haier Appliances India Pvt Ltd (Haier refrigerator), Dainik Bhaskar Group (Dainik Bhaskar Newspaper), Hindustan Unilever Ltd (Dove Hair fall Shampoo and Fair & Lovely anti-marks treatment), Heinz India Ltd (Complan), Kelloggs India Pvt Ltd (Kelloggs Special K), among others, they range from FMCGs to autos, personal accessories to alcohol, and education to media. 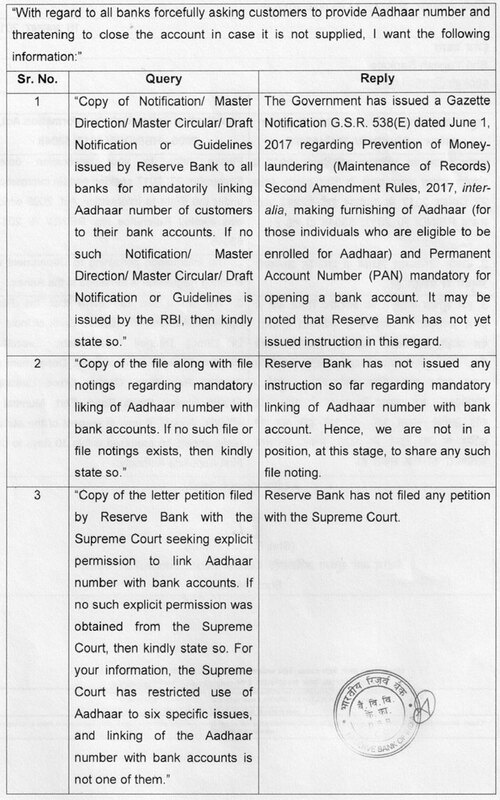 Government notifications forcing you to link Aadhaar to mobiles, bank accounts and other services are illegal, contempt of the orders of the Supreme Court and a disrespect of the rule of law. You can send letters to the authorities that you too can reuse and demand they respect orders of the Supreme Court of India, the Rule of Law and protect national interests as well as yourself. Here are Open Letters to TRAI Chairman and Secretary Revenue to end illegal Aadhaar Coercion. The first to the Chairman of TRAI and the second to the Secretary, Dept of Revenue, asking them to end the illegalities, restore respect of the Supreme Court and respect the Rule of Law. You too can endorse them and spread them by mailing/emailing them, or sharing them on social media till the respective government offices respect the orders of the Supreme Court. Together, let us restore the Rule of Law, the protection of our national security, financial integrity and respect for national interests.